Enjoy weekends relaxing in a pool-side cabana. Live well in spacious apartment homes with newly renovated interiors. Find comfort in extra community features like controlled gated access, garages, and an onsite management team. Experience the benefit of an ideal location with effortless commutes and easy access to shopping, dining, downtown Augusta and the region. 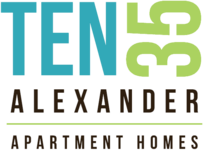 This is TEN35Alexander. It's time to Experience Perfect TEN Living. Stretch out in a one, two or three bedroom apartment home with newly renovated interiors, elegant wood plank flooring, 2" plantation blinds and spa-like bathrooms. Ready to Experience Perfect TEN Living? Copyright © 2019. TEN35Alexander. All rights reserved.